Last night we saw a sneak preview of the Hangover Part II (it opens in theaters today). We were watching an aerial shot of cars driving along a road surrounded by lush tropical foliage and stunning limestone cliffs, and I was thinking “hey, that looks like Krabi”. 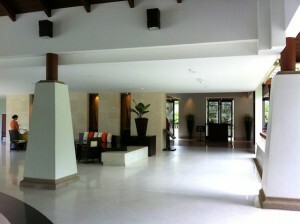 Then they pull up to a resort, and I was thinking “hey, that looks like where we stayed, the Sheraton Krabi”. And sure enough, there’s Bradley Cooper and the rest of the cast walking through the lobby of the Sheraton Krabi Beach Resort. Apparently we stayed at the Sheraton Krabi about one month after the crew had completed filming. I can understand why they chose this resort in particular: unbelievably stunning grounds, gorgeous, secluded beach front location, and impeccable service. The property has a perfect location too – about 20 mins from Ao Nang, and approximately 30 minutes from the Krabi airport by taxi (around 700 Baht). Not to mention only 30 minutes by speed boat to Phi Phi Islands. 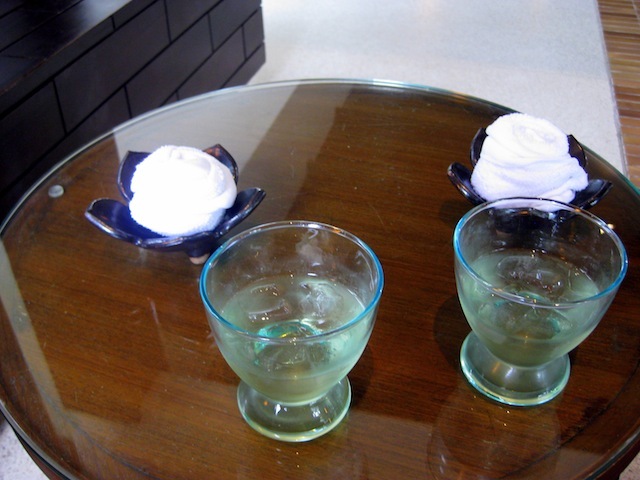 Upon arrival, my husband and I were warmly welcomed, seated and provided with refreshing cold cloths and sweet, icy beverages by the Sheraton guest services staff. It was a sweltering and sticky afternoon, so this gesture was much appreciated. After we were checked in, we were taken by golf cart to our SPG (Starwood Preferred Guest) room by one driver and another staff member. The room was not very far away, but we were grateful for this service as well. Complimentary fruit and cookie plates were waiting for us in our room – a very nice touch. The staff ensured the room was up to our standards, and it absolutely was – huge bathroom, large balcony with a view of the ocean, and an extra comfy queen sized bed. 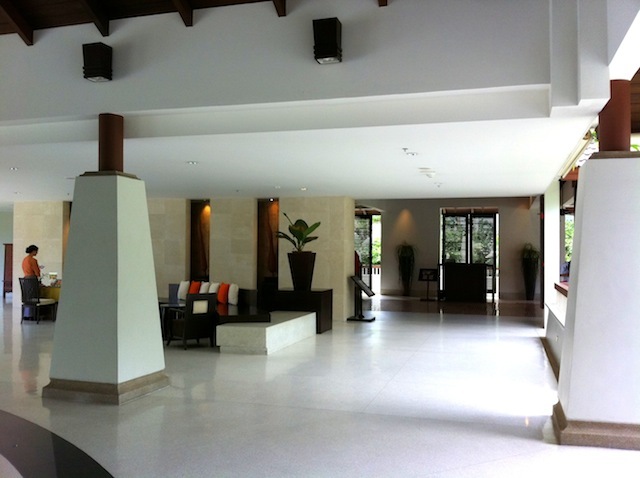 She also informed us that free wireless internet was available at their Link @Sheraton business center. We were thankful for this, since we needed to get some work completed during our stay. Both Gary and I were struck by the tranquility of this picturesque location. 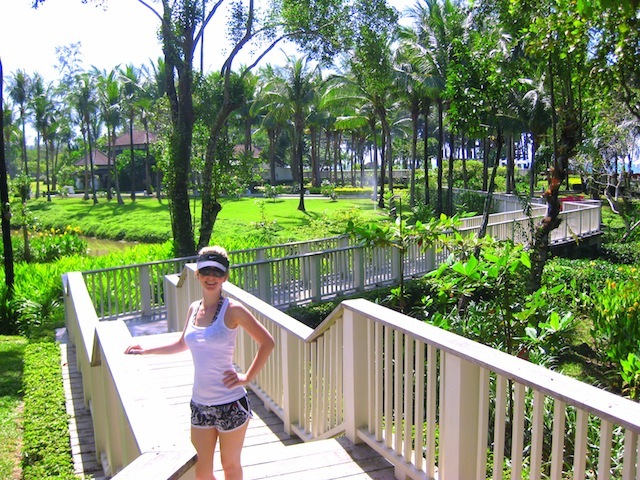 The resort is situated on 5o acres of lush, exquisitely manicured tropical gardens. Thanks to the restoration efforts in conserving and regenerating mangroves, we took a leisure stroll along the boardwalk and explored the mangroves without getting our feet wet. The beautiful property is perfect for their baby elephant (who ‘acted’ in the Hangover Part II) that visits the resort once a week to delight guests. 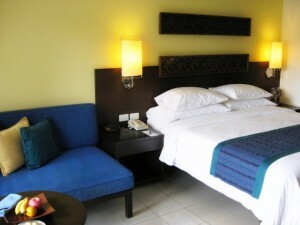 This resort comprises of 246 guestrooms and suites tastefully decorated in contemporary style. A 24 hour fitness center, tennis court, Mandara Spa, two beach-front pools, a long secluded beach, and seven restaurants & bars to choose from: By Thai standards, the Sheraton restaurants are a little expensive. But we found prices were reasonable compared to other similar properties, and considering our Canadian dollar was so high. We enjoyed Mangosteen’s breakfast buffet (500 baht per person) a couple mornings during our week long stay. 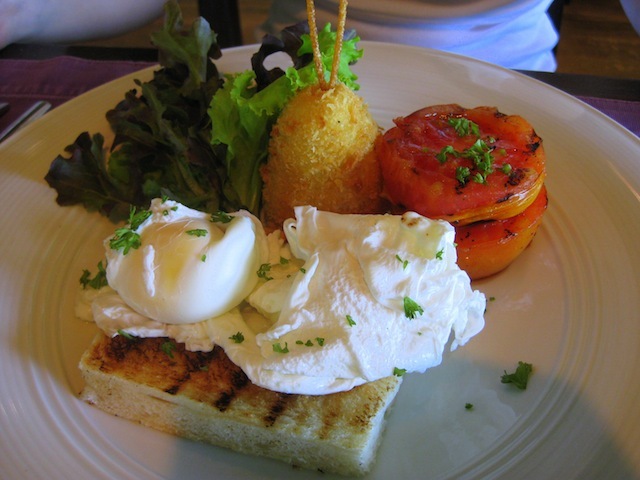 One morning when I wasn’t feeling very hungry, I ordered poached eggs on toast à la carte (pictured below) – it was delicious. We also dined on the beach and poolside, and there are actually quite a few fantastic inexpensive restaurants directly outside the property. We enjoyed Jumpa a few times (you can read about our experience here), and Ruean Siam Restaurant right on the beach. On the last night of our stay, we came back to our room and were greeted by a very strong chemical odor. The smell was a little nauseating, so we called the front desk and they informed us that workers were painting the bathrooms of the floor above. They offered to move us to another part of the resort, and we gratefully accepted. A staff member was very quick to to take us to our room and assist with luggage, and apologized profusely for the circumstances. We were exceptionally impressed by their fast and efficient service. After we were settled into our new room, a plate of chocolates was sent up to us with a card apologizing again for the inconvenience. 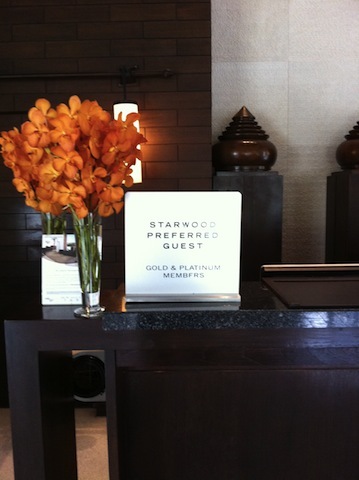 For us, the situation wasn’t that huge of a hindrance, but the Sheraton went above and beyond to ensure we were happy. This is a resort I can really see us returning to – it was just so perfect: Superior attention to detail, hospitable service, and incredible idyllic setting make the Sheraton Krabi Beach Resort the ultimate tropical getaway. 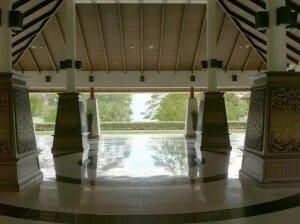 Read our review of the Sheraton Krabi beach and pools here.